San Diego has long been a military town from the early days. With facilities today like the Marine Corps Recruit Depot, Marine Corps Air Station Miramar, Naval Air Station North Island and others, the number of military personnel and families who reside in the surrounding communities is large. 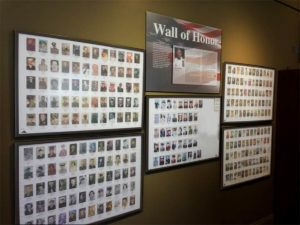 The Wall of Honor was started in 2006 at the Museum as a tribute to individuals who have served in the military throughout the years. Individuals are shown in a photo with along with their name, their branch of service, and date they served. To date there are over 200 individuals recognized in the display. Residents of Rancho Bernardo and adjacent communities can request to be placed on the Wall of Honor. Requests can be made by filling out our Wall of Honor Form and bringing it to the museum, along with a photo of the veteran. We will then review and process the request for inclusion to the Wall of Honor.